* Please note that this workshop normally costs￥10,000 to attend so this is a special price offered through SIETAR Japan. 1. Your name, 2. Email address, and 3. Your membership status (e.g., member, non-member, student, graduate student). You look but do you really see? “One must always draw, draw with the eyes, when one cannot draw with a pencil,” is an artists’ motto. Art is a tool that can wake up your non-verbal communication and perceptual skills. How could that affect your life? So many people are afraid of drawing and creativity. Will it open a Pandora’s Box? We try to draw what we think we see, rather than what we actually see. Would you like to see what is really there rather than what you “know”? Businesses often tackle a problem in the same way – by tackling what they think they see as the problem rather than carefully looking and analyzing what the real problem is. Drawing is nothing but problem solving in action. It shifts you into a different way of thinking. By using analog drawing exercises, we will explore a new way of communicating with your non-verbal self. If you trust the process, surprising answers will appear. This is a one-day workshop that will teach you a new kind of language, a language of colors and shapes. It sometimes seems like an alchemical process which can reveal the solutions to puzzles in your life that you haven’t been able to solve. It may trigger an ongoing process which can open up unexpected possibilities in your life. One participant described it as taking the lid off his old way of thinking. The results always surprise me, even after teaching it for many years. Kristin has given several TED talks in Tokyo, on the GreatWall of China, and for Sebasi in Korea. In addition to giving corporate workshops, she also teaches art and creativity at The International College of Liberal Arts at Yamanashi Gakuin University during the spring term. As a glass artist, Kristin is currently focused on creating artwork from fused glass and silver. Shinjuku i-Land Tower can be accessed directly from Nishi-Shinjuku Station on the Marunouchi Line by following the underground path. From JR Shinjuku Station, it is an approximately 10-minute walk. In the building, select an elevator that stops on the 4th floor. Follow the corridor to the right until you get to the last door on your left. *Reservations appreciated. Please respond to e-mail: programs@sietar-japan.org with your name, email address, and your membership status (member, non-member, graduate student). Creative and innovative thinking is a skill set that is now in high demand by many companies as they want it in their employees. Where does it come from, can it be measured, and can we develop it though? These are some of the questions being asked and even NASA has tried to address these problems to some extent to try and get the most from their staff. So to creativity. Most children are naturally creative, however, it has been argued that very few adults are naturally creative as this attribute has in many cases been educated out of them (Land & Jarman, 1998; Robinson, 2010). This workshop is designed to highlight some of the factors that can inhibit creativity in individuals, teams, and organizations. In the session, we will focus on different ways to more successfully address problems in a creative and innovative way by modelling ways of tackling these factors, solutions such as reframing problems, challenging hidden assumptions, and approaches to creative play in teams. The workshop will be highly experiential in nature, requiring each attendee to participate actively, both alone in some cases, and in pairs or teams most of the time. No prior knowledge of any kind is necessary, but be prepared to use your hands and your heads and be ready to have fun! After the session attendees should be able to apply the mindsets needed to fully utilise a creative approach to get past mental roadblocks in their creative thinking and innovative problem solving. Rab Paterson (BA, MA, CoETaIL, MS, FRAS, FRSA, EdD Candidate) is the Principal Instructor for both Toyo University’s Center for Global Education BEST (Business English Skills and Training) program and the Toyo University-UCLA Extension Center for Global Education’s BEC (Business English Communication) program. He’s also the current Director and Webmaster of the Asia Association for Global Studies, Webmaster and Program Chair for JALT BizCom, and holds memberships in many other educational technology / professional teaching associations. He’s an Apple Distinguished Educator, an Apple Teacher, a Google Innovator, Trainer, Google Educator Group Leader for the West Tokyo GEG, and lives in a semi self-built, eco-friendly, sustainable lifestyle log-house of his own design in the foothills of the Japan Alps with his family, their two dogs and their goat! 10 minutes` walk from Shibuya Station of the JR Yamanote Line and Saikyo Line, the Tokyu Line, Keio Inokashira Line, etc. SIETAR Japan’s year end party will take place on December １st, Saturday, from 18:00 to 20:00 at La Valse. This workshop will be an opportunity to learn how to use the Diversophy Ⓡ. Hikasa, who was born and raised in Japan, has studied in the US, Australia and Finland. 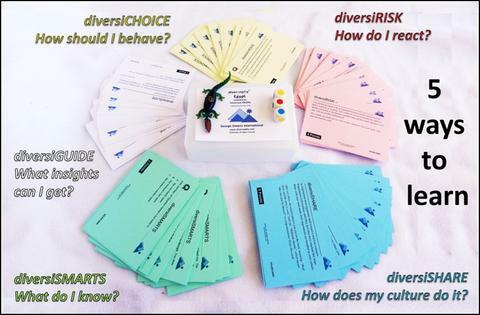 While studying in Finland in 2017, Juri Hikasa first played Diversophy Ⓡ, a card game and great tool for enhancing intercultural competence. 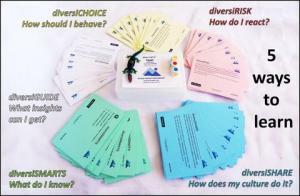 She then worked as a virtual intern with George Simon International in France to develop the first Japanese language set of Diversophy Ⓡ cards. She is currently a graduate student at Juntendo University in the Education Department. SIETAR JAPAN will hold its 2018 SIETAR JAPAN World Congress. For more information, please go to our Official SJWC 2018 website! In this workshop, we will explore the possibility of using embodied experiences and bodily sensations as a source of knowledge for intercultural communication. The lived body is both an affective medium of subjective experience and a site where power relations and ideological norms are habituated. The presenter will use her own experiences as a racial minority and cultural Other in the U.S. to examine how an awareness of our own bodily sensations and visceral feelings may help us gain greater insights into intercultural communication. Sachi Sekimoto (PhD., University of New Mexico) is an Associate Professor at Minnesota State University, Mankato. Her scholarship focuses on culture, embodiment, and sensory experience. She is currently working on a co-authored book on race and the senses. She co-edited Globalizing Intercultural Communication: A Reader with Kathryn Sorrells. Her published articles include: A Multimodal Approach to Identity: Theorizing the Self through Embodiment, Spatiality, and Temporality; Transnational Asia: Dis/orienting Identity in the Globalized World; A Phenomenology of the Racialized Tongue: Embodiment, Language, and the Bodies that Speak; and Race and the Senses: Toward Articulating the Sensory Apparatus of Race. Get off at Yotsuya Station on the JR Chuo/Soubu Line or Metro subway Nanboku or Marunouchi Line. 3 minute walk to Sophia University campus. Building 2, Room 915 (9th floor). On May 21, Dr. Jack Condon has graciously agreed to take time from his busy lecture schedule for a relaxed evening with SIETAR Japan members in Tokyo. He will add a new take on his previous workshop in Tokyo, discussing the still radical insights of Edward T. Hall, the anthropologist who introduced the term “intercultural communication” and who inadvertently launched our field. Hall’s work takes on new significance in light of advances in neuroscience research. Hall was Jack’s friend, colleague and neighbor for nearly 40 years. Jack’s book on this theme will be published later this year. This evening program will have the more relaxed and informal structure of a conversation: following brief introductory comments by Dr. Condon, Dr. Kaoru Yamamoto will lead the discussion, welcoming comments and questions from the audience. There will then be an hour for further discussion and conversation over wine and cheese. John (Jack) Condon is regarded as one of the founders of the field of Intercultural Communication, writing one of the first doctoral dissertations when that was not yet a recognized area of study, and later he was one of the founding faculty of what became today’s Summer Institute of Intercultural Communication (in Portland, Oregon). He also was in the group that would later found SIETAR, and a recipient of awards for his teaching and writing, including the first dedicated college textbook in our field. Of his nearly 20 books, With Respect for Japan is perhaps his best known in Japan. In the 1970s as a professor at ICU, Dr. Condon influenced many of Japan’s future interculturalists. At that time, the American Chamber of Commerce in Japan asked him to develop their first intercultural communication workshops. Beginning his college years in Mexico City, Jack eventually would live and work abroad for twenty years, in Latin America, East Africa, and here in Japan. Currently Emeritus Professor of Communication at the University of New Mexico, he continues to teach at SIIC and offers workshops and field seminars in northern New Mexico where he lives. Next January he will co-facilitate a new traveling seminar in “Mayan Country” (in Mérida, Yucatán, Mexico), with Claudia Chapa Cortés, which will span two thousand years, from the earliest settlements to contemporary intercultural contacts via varieties of tourism and international gentrification. We are pleased to invite Dr. Kim A. Case, an outstanding scholar and educator in the field of social psychology and gender studies. Dr. Case will speaking about why it is important to teach about privilege using intersectional approaches and how to infuse this perspective in the teaching of social justice. Dr. Kim A. Case is a Professor of Psychology, Director of the Applied Social Issues graduate program, Director of Undergraduate Psychology, and the Faculty Mentoring Program Chair at the University of Houston-Clear lake, Houston, Texas, USA. She is a Fellow of the American Psychological Association and of the Society for the Psychological Study of Social Issues. Her publications include Deconstructing Privilege: Teaching and Learning as Allies in the Classroom (2013) and Intersectional Pedagogy: Complicating Identity and Social Justice (2017). ​Program Abstract: ​SIETAR JAPAN’s final event of the year will be a director screening of the award-winning documentary, For the Bible Tells Me So. Director Daniel Karslake will introduce his film exploring the intersection of the religious right and homophobia, focusing on how conservative Christians’ interpretation of the Bible is commonly used as a way to deny homosexuals equal rights. In the film, Karlake follows five families with an openly gay son or daughter to offer a first-hand look at how those in the Christian community with an out child are affected by the homophobic fervor. Get off at Yotsuya Station on the JR Chuo/Soubu Line or Metro subway Nanboku or Marunouchi Line. 3 minute walk to Sophia University campus. Building 2, Room 508 (5th floor). The fees for food and drinks will be JPY 6,000 for SIETAR members, JPY 7,000 for non-members. *Reservations appreciated. Please respond to e-mail: programs@sietar-japan.org with your name, email address, and your membership status (member, non-member, student, graduate student). Hāfu2Hāfu is a unique and ongoing project photographing 192 hāfu (mixed roots people with one Japanese​ ​parent)​ from every country in the world and sharing their most significant questions about identity, sense of belonging or ​growing up with two different cultures. Photographer and Belgian hāfu Tetsuro Miyazaki will give a presentation about his project, followed by an interactive workshop about being of mixed roots. Tetsuro Miyazaki is a 39 year old half Belgian half Japanese photographer living in the Netherlands. He started Hāfu2Hāfu in 2016 as a personal investigatory project about his half Japanese identity. After having photographed over 20 Dutch hāfu in 2016, he presented the project at the Hapa Japan Festival in Los Angeles in February 2017. The Shinso Ito Center (USC) and the Isaac Albert Ailion Foundation (Leiden University) have allowed Miyazaki to start working on the next chapter of Hāfu2Hāfu: photographing and interviewing one hāfu from every country in the world. His goal is to collect one question and portrait from hāfu from each of the 192 different country-combinations, of different gender, age, place of birth and upbringing, and sociocultural backgrounds. He is undertaking this project in Japan as well as abroad. Are we utilizing our kinetic expression to the fullest potential when we communicate with ourselves, others and the things around us? Through movement exercises with somatic touch, we will learn how to “face” ourselves and others effectively. Please wear comfortable clothes, even though we will not be doing rigorous physical exercise. It will be best to work barefoot or in socks (or tabi) in order to avoid injury. Provides training sessions in various martial art forms, both ones that use various traditional weapons such as katana swords or wood sticks, and without. Provide training sessions to apply basic martial art movement to learn how to use one’s body most effectively (without unnecessary force) for sports and patient care-giving. Masaharu Nomoto, Representative of Kenjyu-kai (Training Center of Traditional Japanese Martial Arts, Kobudo), teaches and coaches the general public how to apply basic martial art movement to enhance their effectiveness in individual work performance and human relations in addition to instructing serious martial art students. He teaches at a wide variety of organizations such as local culture centers, individual coaching (including some well-known Japanese celebrities), and a voice training school. He works with athletes, healthcare professionals. and people from all walks of life. 2003. Started to receive instruction by Master Yosinori Kouno, one of Japan’s leading martial artists who also holds workshops on how to move efficiently for health care givers and professionals. 2007 Started receiving instruction from Masaru Nagano, representative of the Juken-Raishin Kai, Martial Arts Training Center. 2009 Received certification as an instructor by the Juken-Raishin Kai, started giving instruction at Culture Centers in Omiya and Kanamachi. 2013 Established his own training center, KenJu-Kai. Program title: The challenges of global forced displacement – can the UN Refugee Agency cope? Pre-registration is encouraged to insure your place: e-mail: programs@sietar-japan.org. Please note whether you are a member or non-member when registering. June 20th is World Refugee Day. Imagine the desperation that forces men, women and families to leave behind everything they know and love, and risk their lives in flight into an unknown future. Dirk Hebecker will give a brief introduction to the history and work UNHCR currently does globally in support of refugees and other people of concern. This will include what a refugee is and how a refugee is different from a migrant. He will touch upon the (popular and common media) myths about refugees, challenges of xenophobia and rejection of refugees and migrants by the wealthy global North and West as well as the hurdles to refugees’ integration and well-being. Finally, he will talk about the situation of refugees and asylum-seekers in Japan, the distinct challenges Japan is facing in this area, how UNHCR is trying to help improve both domestic asylum policy and practice as well as the challenges refugees and asylum-seekers face in Japan. Dirk Hebecker is the 12th Representative of UNHCR in Japan, arriving in May 2016. He joined UNHCR in 1993 as Associate Repatriation Officer in Hanoi, Vietnam, after working for the Ministry of Foreign Affairs in his native Germany and the German Embassy in Hanoi. Since joining UNHCR, he has worked in humanitarian affairs in Georgia, Myanmar, Sri Lanka and Bangladesh, as well as UNHCR Headquarters in Geneva. He was also seconded to the Office of the High Commissioner for Human Rights (0HCHR) in the Russian Federation. Prior to his assignment in Japan, he was Representative of UNHCR in Korea. Hebecker majored in international relations and South East Asia studies and is fluent in English, French, Russian and Vietnamese. UNHCR, the UN Refugee Agency, was established on December 14, 1950 by the United Nations General Assembly. UNHCR safeguards the rights and well-being of refugees and stateless people. In more than six decades, the agency has helped tens of millions of people restart their lives. UNHCR is on the front lines of the world’s major humanitarian crises, including Syria, Iraq, Central African Republic, Afghanistan, South Sudan, the Democratic Republic of the Congo, and countless other emergencies. Venue: Sophia University Yotsuya Campus, Tokyo.